Tack It | Pro Chem, Inc. 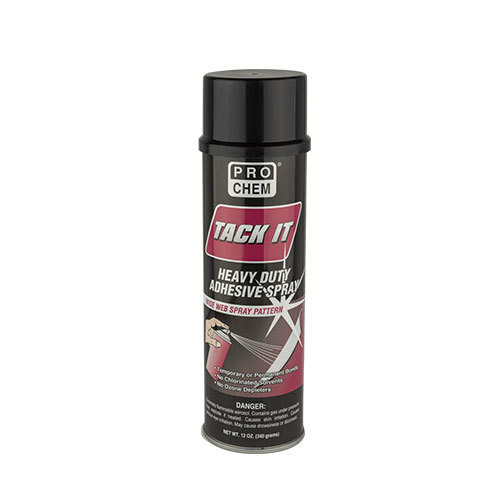 TACK IT is the highest performance wide web spray adhesive available. Excellent for both temporary and permanent bonding. TACK IT is perfect for uneven or porous surfaces and is waterproof, flexible and transparent. It can be used on materials such as cardboard, polyethylene, sheeting, leather, most plastics and cloth. Spraying one side will create a temporary bond where as the treating of both surfaces will create a permanent bond. Always shake well before using. Never aim valve at face. Hold can upright and apply adhesive in a side-to-side motion 10 to 14 inches from surface. For temporary bonds, spray surface, allow to become tacky, then bond surfaces together. For permanent bonds, liberally spray both the surface and material, allow to become tacky, then bond the surfaces together. Not intended for use on vinyl.